Missoula-based trail runners take their pick of prime destinations. I’ve been spoiled myself by close proximity to truly wild country, some accessible from where I work downtown. Yet notwithstanding the stunning routes close to home I recommend venturing from time to time into Montana’s true backcountry where some of the nation’s earliest, largest, and most venerated wilderness areas can be found. 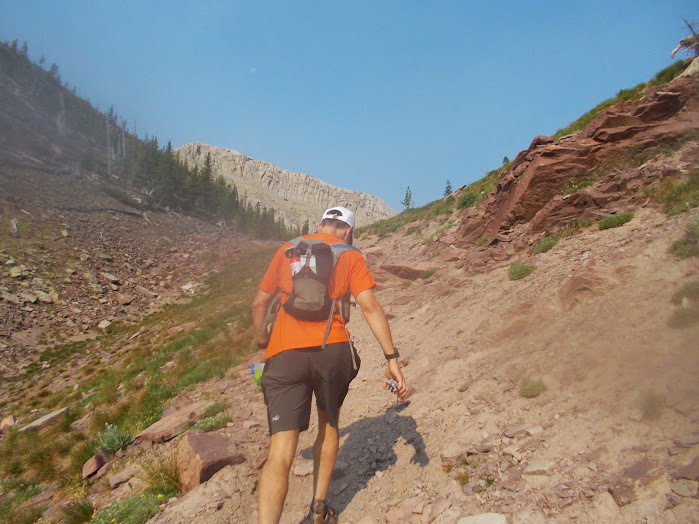 I was fortunate to join 15 runners to do just that—to attempt a 55-mile run across the remote Bob Marshall Wilderness Area in just one day. A slice of the Bob. Photos courtesy of Jared Oyler and Geno Bassett. ﻿The 240,000-sq. mile swath of wild country, known affectionately as “the Bob,” actually includes three separate wilderness areas—the Bob Marshall, Scapegoat, and Great Bear. Mr. Bob was the spirited conservationist and cofounder of the Wilderness Society. He spent several years in Missoula while working for the Forest Service. I’m not sure how much time this giant among conservationists spent in what later became his namesake, but I can imagine he was familiar with it. Legend has it that Bob was fond of forging multi-day expeditions into the backcountry, covering long distances with few provisions. That’s kind of what we were planning to do. Ultrarunners would be pleased to know that he set the record for the most Adirondack peaks bagged in one day. Tim Mosbacher and Andy Tucknott, scouting a portion of our route, were told that it could not be done in one day. Period. Traversing on foot sixty miles east to west as the crow flies, the aviator told them, was impossible in one day. Even if his mileage was off, the spirit of his sentiment was clear: if by airplane or map the country appeared big, just try to imagine negotiating it close up. Of course when someone says something can’t be done, human nature (or folly) itches to prove that wrong. Steve Brown, who bore the original vision and persistence, insisted it could be done, and in his soft-spoken way convinced the rest of us to believe him. Steve generated some real, lasting interest: of those originally invited to join the expedition, only two declined due to other commitments, and even a few others—myself included—were invited to join in the venture after the date had already been set. If this bus has wheels, how could we not climb aboard? The prospects and company were too alluring. Admittedly, the plan posed logistical challenges. How to drop off sixteen people and their gear at the eastern edge of the Bob Marshall at a random point thirty miles down a dirt road, and then arrange to pick them up (how many hours later?) at Holland Lake where—if they made it—they would be fed, nursed, and transported home. For us, this meant a real community effort. Andy Tucknott, a motivating force behind this crazy idea but struggling with an injury, shuttled some of us and our gear to the campground at Benchmark. So did JB Yonce, a rock in the Missoula running community still recovering from a health scare at the Boston Marathon. Andy and JB, along with John Hart and Kate Oyler, drove us to the campsite and stayed with us till morning. Around 4:30am I heard the first whispers outside my tent. Headlights moved about the dark sky like phantoms. It was time to rise. Under a bright moon, folks huddled around a picnic table sipping coffee and munching oatmeal. John Hart, who had just finished the Western States 100 (in under 24 hours I might add), said it reminded him of an aid station at hour 21 of a 100-mile race. 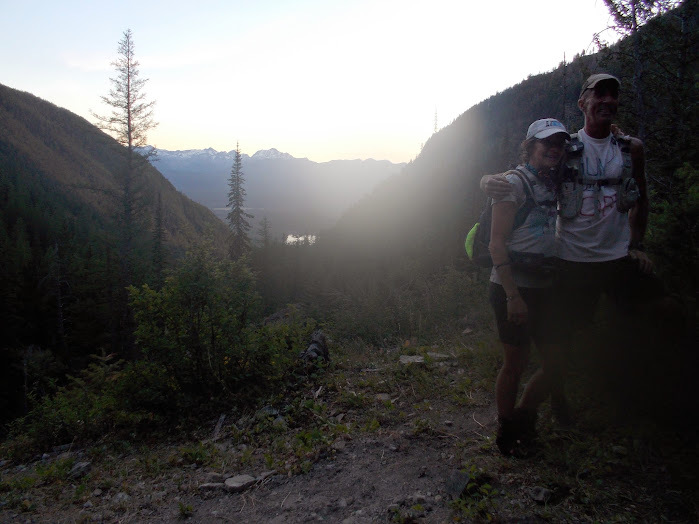 The group mood brimmed with excitement and anticipation as we loaded our gear into JB’s boat, bade farewell to our good shuttlers, and started along the trail single file, the light from our headlamps bouncing up and down like fireflies. Everyone looked forward to the morning portion—from Benchmark campground we faced flat miles shadowing the South and West Forks of the Sun River. Within a few miles we emerged into the burned-zone, stripped-bare trees reminders of mighty fires that had swept through in 1988 and recently. Signs alerted us to keep our eye’s peeled for bears. Of the 1000+ grizzlies populating the West, many make the Bob and the adjoining Glacier National Park their home. At about Mile 5 we crossed the bridge spanning the South Fork and enjoyed the single-track paralleling the river closely from a bench line through shaded undergrowth. The running here was a delight. The sun lit the high mountain rocks towering over Sun River, creating a reflection of deep red and orange hues. Those first miles we made good time: 10 miles in a little more than two hours. The South Fork of the Flathead River at dawn. Many runners prefer running solo accompanied only by the trail, landscape, and their own thoughts. I’m one of them. But having company and conversation this day turned out to be a real delight—and here we had real variety. Youngish and oldish. Men and one woman. One new and several soon-to-be dads. We had attorneys (running is an analytical pursuit, so Steve claims), a professor, businesspeople, computer techs, grad students, retirees, philanthropists (yes that’s you, Rick). Thankfully I had the chance to speak with most of them during the 15+ hours on the trail. The commonality, no surprise, was passion of running. 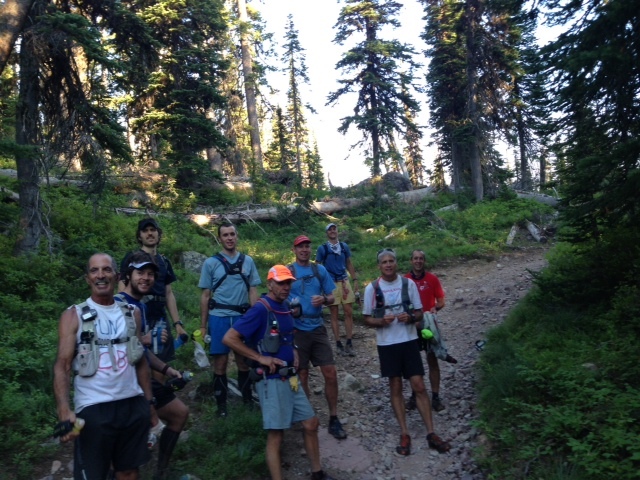 Grizzled veterans with multiple ultras under their belts loped with impressionable yet still dedicated newbies eager for more miles and the camaraderie. We snaked our way down the pass at a good clip and reached the South Fork of the White River. A short distance on we forded the main river and followed the trail for about 5 miles to White River Park and the confluence of the White River and the South Fork of the Flathead River. This was mostly a flat trail, but with the day’s heat bearing down upon us we made slow progress. At the section’s end, where we faced another crossing of the White, many paused to soak in the river. I noticed that smiles still adorned most faces, but they seemed a bit forced considering what immediately confronted us still: the long slog along the north bank of Holbrook Creek and into the Big Salmon Creek drainage. River crossing near the confluence of the White River and the South Fork of the Flathead River. I reveled in the shade cast by ponderosa trees near the confluence of the White and the Flathead. The ponderosas that had escaped the burn towered over the budding undergrowth of Douglas firs and Lodgepole pines that were locked in a Darwinian survival struggle. Once we hit the trail up Holbrook, (take caution in locating this trail, it’s not easy to find) we faced a dry, gradual ascent. I was running out of water having opted not to drink unfiltered from the White. Although the trail paralleled Holbrook Creek, the water was still a distance off the trail. But when we reached a point where Holbrook Creek was merely a trickle, we stepped off the trail to spend several blissful moments drinking to our hearts content. By the time we reached Big Salmon Creek drainage on the other side of Holbrook and within striking distance of the Forest Service’s Pendant cabin, the strain of the previous 40 miles was beginning to manifest. The food thing is sometimes difficult to get right on long runs. Each runner has to figure it out for herself, but there can be no surefire way to prevent nausea, diarrhea, or vomiting. Puking on the trail makes for a long day, and that is what at least two of our crew faced, but they eventually came through beautifully. Stomach issues are common to ultra running, though perhaps a few in our group may blame this day’s manifestations on the Omni Bar, a new product featuring a curious blend of sweet potato, apricot, raisins, nuts, beef, and god knows what else. Tim M. jokingly remarked (twice, just to be understood) it would be impossible to know whether one’s diarrhea derived from the Omni or from unfiltered, mule-tainted water. Someone should volunteer for a controlled experiment someday. The last 10 or 12 miles featured a major hill climb and thigh-pounding descents passing Pendant Lakes and Upper Holland Lake before the final stretch. By this point the group had stretched out a bit, with clusters gunning for the end. Near Pendant Pass, where they had been patiently awaiting our arrival for several hours already, Andy Tucknott and Anders Booker greeted us with wide smiles and huge high fives. By far the last six miles were the fastest pace of the day, as well as perhaps some of the most scenic with the green forests of Holland Lake looming close and the Mission Mountains forming the backdrop. I reached the end of the trail on the north end of the lake around dusk. Along the way there had been wistful hoping that our group would run into a well-stocked aid station staffed by bikinied women. We had much better luck at the finish where a crowd of true-blue Missoulians heralded our arrival and showered us with food, drink, and good cheer. Many thanks to Renata Bush (those grapes were manna from heaven! ), Julie Gilchrest, John Fiore, John Hart, Mike Foote, JB Bonce, Andy Tucknott, and likely many others who I’ve inadvertently forgotten. Becky and Dave with Holland Lake -- and the finish -- looming. Seeing the Bob on a map is not seeing it at all. The Bob is best experienced by venturing deep within, maybe even traversed, over one day or seven. But having now crisscrossed a portion of it I still find it hard to wrap my mind around the scale of it all. Perhaps that’s just as well. Wilderness—some places with the official designation, many others not officially “protected” but just as “wild” and “untrammeled,” at least for now—perhaps best remain the vast, untouched, mysterious places that we time and again return to for renewal. Great recap of our adventure, Jed. I think you really captured the day. Really fun, and great video, too.